Huckleberry – NorthernShield Resources INC. 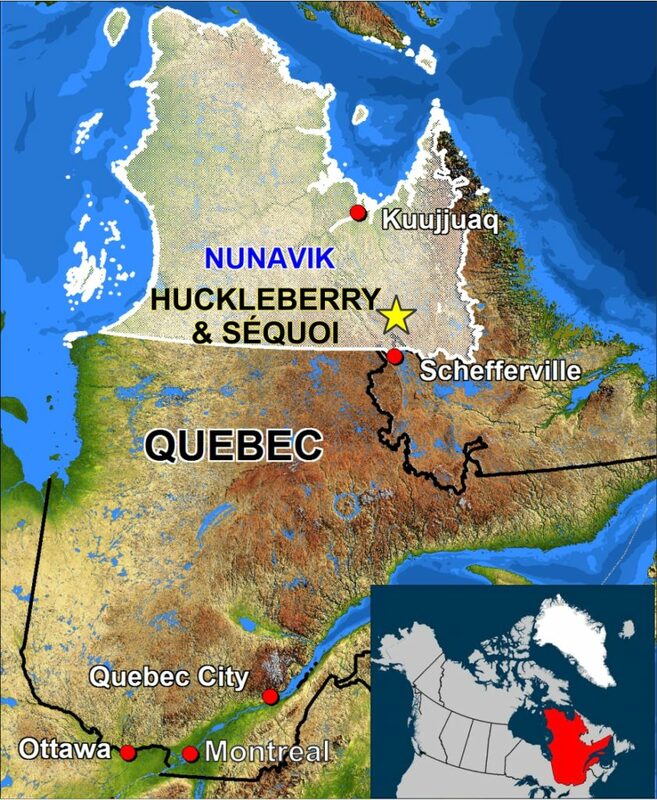 The Huckleberry Property is located 100 km north of the town of Schefferville, within the Nunavik region in the province of Quebec. The Huckleberry Property consists of 111 claims covering 54 km2 and are currently 100% owned by Northern Shield. 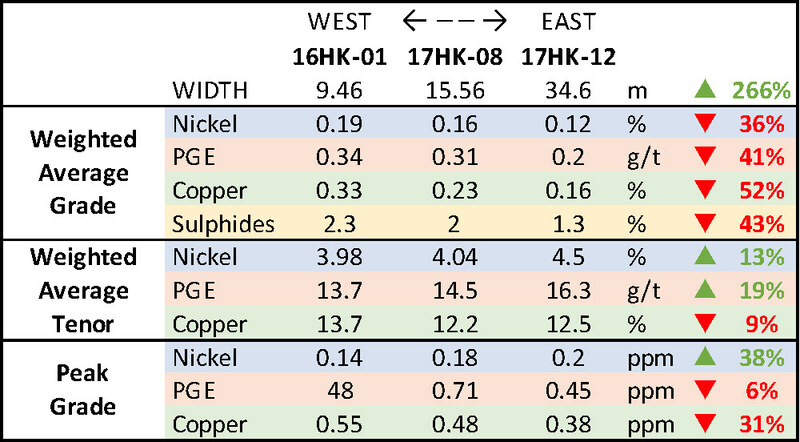 Huckleberry is being explored as a large-scale magmatic copper target with associated nickel and platinum group elements (PGE). 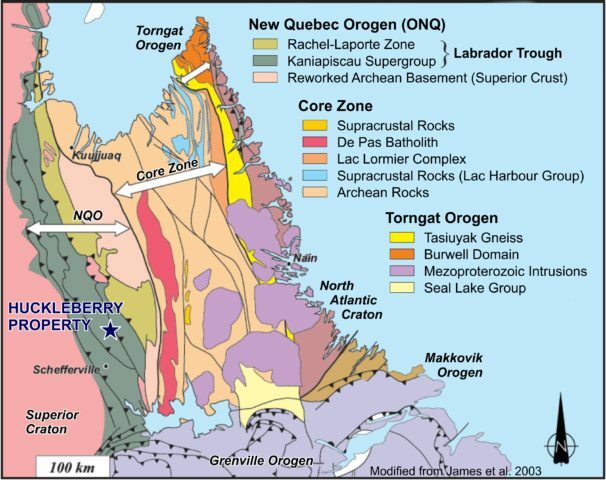 Geologically, the Huckleberry Property is found within the Labrador Trough, a Paleoproterozoic supracrustal sequence located at the eastern margin of the Superior Province. The sequence was folded and metamorphosed during the New Quebec Orogen, which represents the collision between the Superior Craton and the Core Zone of the Southeastern Churchill Province. The Labrador Trough is over 500 km long and is composed of three cycles of sedimentation and volcanism (Clark and Wares, 2005), separated by erosional unconformities. Each cycle is further subdivided in groups and formations. 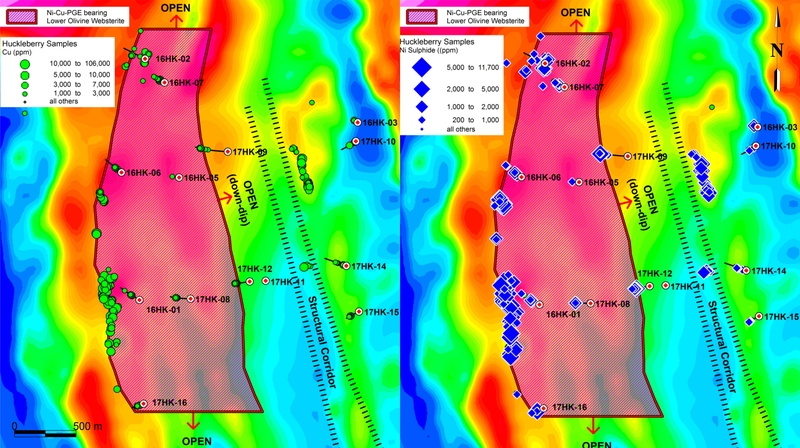 In June of 2014, the Company staked the Huckleberry Property in the southern Labrador Trough based on its potential to host Cu-(Ni)-PGE mineralization. Three samples from a gossanous outcrop, measuring approximately 50 x 150 metres and located near the contact between olivine websterite and glomeroporphyritic gabbro, returned high values of copper and PGE. Despite the good results, limited exploration budget in 2015 only allowed for basic reconnaissance with sampling and geochemistry. Of importance that year was the discovery of a large angular boulder within the property consisting of an anorthosite breccia cemented by chalcopyrite that assayed 4.04% Cu and 0.92 g/t PGE+Au. The fragments of anorthosite that compose the breccia also contain finely disseminated chalcopyrite and are identical to mineralized anorthosite (GPG) seen elsewhere within the property. 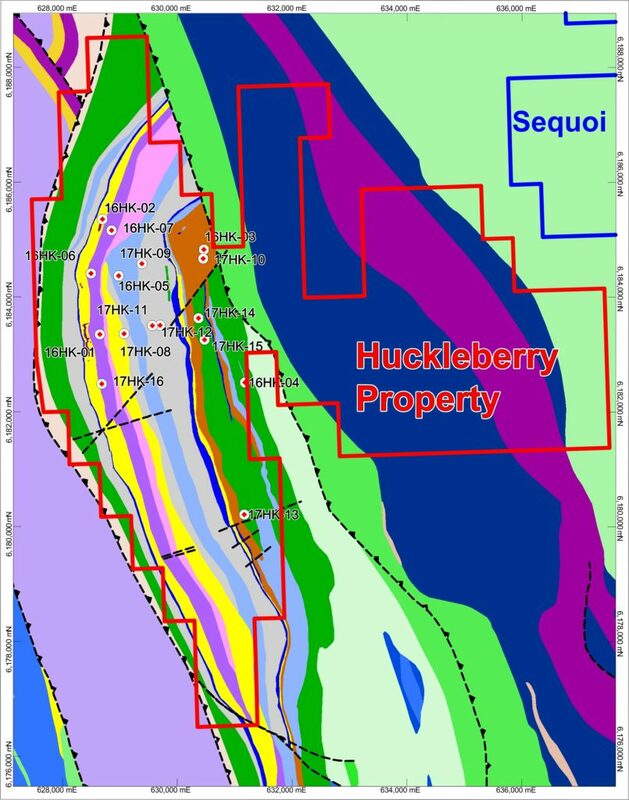 Thus, the boulder is very likely to originate from within the Huckleberry Property and suggests that there is more high-grade copper mineralization yet to be found at Huckleberry. In early 2016, Northern Shield signed and option agreement with South 32 of Australia. A VTEM survey was flown, followed by a mapping/surface sampling program in the summer and a 2,000 meters drill program (7 holes) in the fall. In the spring of 2017, still under the South 32 option deal, a ground gravity survey was completed and a further 3,200 meters (9 holes) were drilled. The magmatic geology and geochemistry of Huckleberry is complex and somewhat atypical, making interpretation extremely challenging. There are multiple phases of mafic/ultramafic intrusions, all of which are undergoing in-situ fractionation and/or differentiation; the parental magma from which these were all derived was a relatively differentiated basalt; there is considerable inter-mixing of at least two of the phases of magma; faulting and deformation was on-going during time of intrusion; some of the mineralization and sills are the result of downward “injection”. 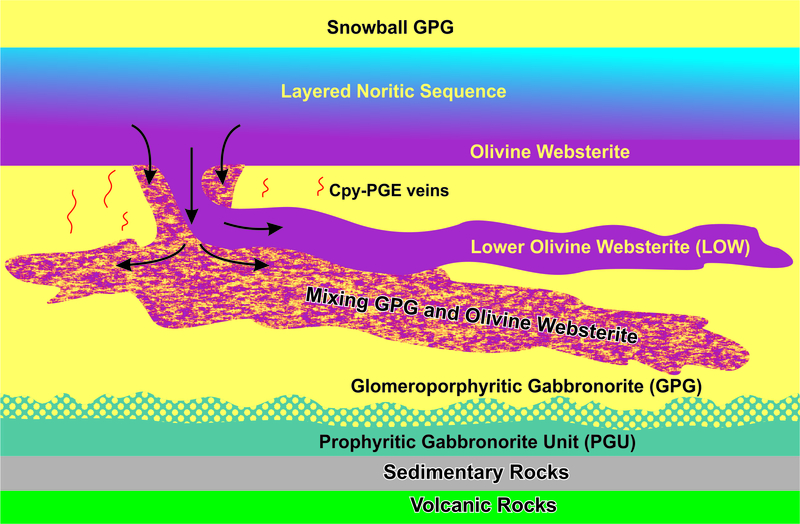 Based on geological and geochemical data, the Huckleberry intrusion was divided into three main sequences: the Layered Gabbroic Sequence (LGS), the Glomeroporphyritic Gabbronorite (GPG) and the Layered Noritic Sequence (LNS), which includes the olivine websterite unit (formerly OMG). The first sequence to intrude the volcano-sedimentary rocks is the LGS, a mafic differentiated sequence of mainly gabbro and gabbronorite. The LGS is then separated in two blocs by an east-west fault. The GPG intrudes into the sedimentary rocks between the two blocks. There is clear evidence in core that the GPG was emplaced through more than one pulse. Finally, the LNS intrudes in the middle of the GPG sequence, which is still a mush at this stage. 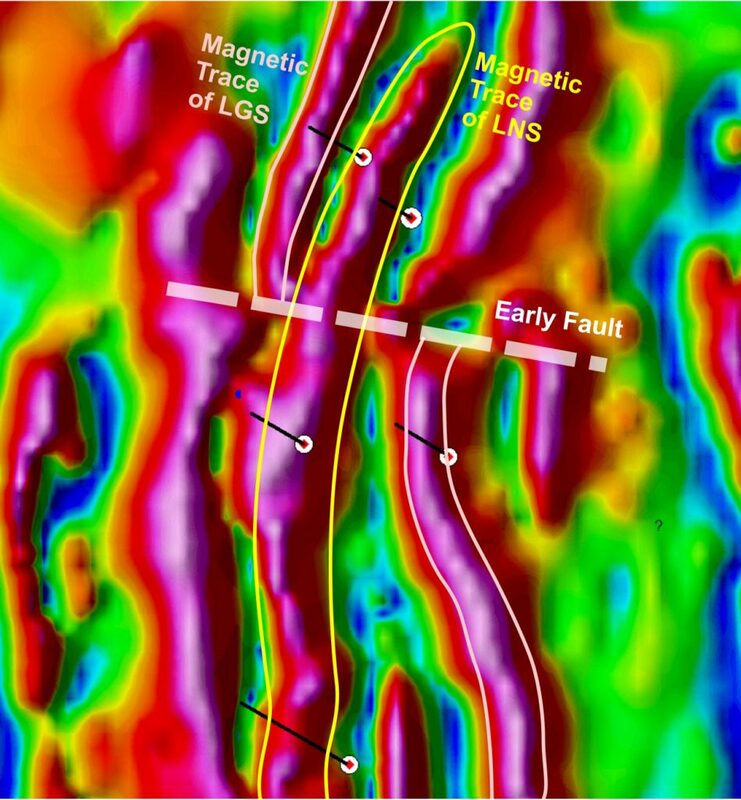 This sequence of events is backed up by geological field and drilling evidence and geochemistry but also by patterns of the magnetic fabric (tilt derivative of total magnetic field, VTEM™ survey) on the western portion of the Property. The Discovery Zone, representing the most extensive surface mineralization known to date within the western portion of the sill complex, extends for about 600 metres. Copper and locally PGE mineralization is found in the Lower Olivine Websterite (LOW) but it is mostly located in GPG at this occurrence. The principal host to the mineralization found to date however is the LOW, which represents the base of the LNS that was partly injected into the GPG below. The main mineralized zone, which consistently increase in thickness, PGE and Ni tenors in a down-dip direction, could be interpreted as a disseminated halo around a massive sulphide occurrence. Also, mineralization found in the Eastern Zone is currently thought to be the result of possible “leakage” from massive sulphides at depth through co-magmatic faults. A summary of 2016 and 2017 drill results is presented in the table below.